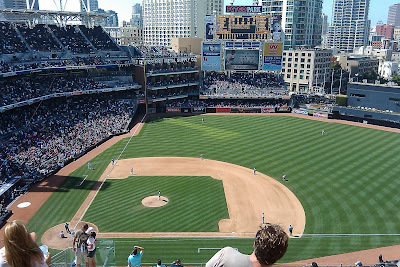 A Building Roam: Will the Padres win another game this season? 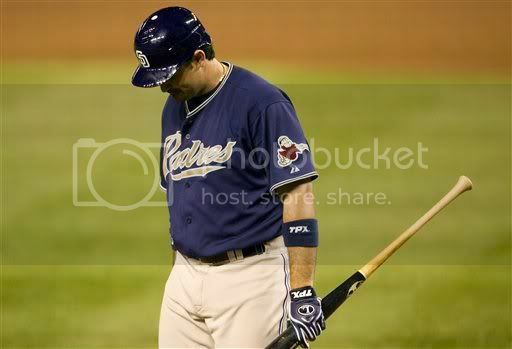 After another loss to the Colorado Rockies yesterday afternoon, the Padres have now gone 9 games without a win. It's the longest losing streak in seven years and the fans here in San Diego are starting to worry that maybe the clock has struck midnight very abruptly on this magical season and this Cinderella Pad squad is turning into a pumpkin. They had been cruising along at an essentially perfect pace for 5 straight months to start the year. Their record and run differential was better than all but the best two teams in baseball. Counting last year they've actually been playing like the best team in the National League for 7 straight months (they finished the season going 32-21 in the last two months of '09). They had not even had a losing streak longer than 3 games throughout this year and had only experienced such a streak twice. Now they seem to have ran into a wall and are having trouble getting back up. Well-executed fundamental baseball has been a constant for this crew but we've seen the defense coming apart at the seams in this sloppy 9-game slide. The other night Miguel Tejada, for no apparent reason, tried to catch a throw from the second basemen with his bare hand to start a double play. It was a ridiculous thing to try and he totally missed it, granting the D'backs two extra outs for the inning. 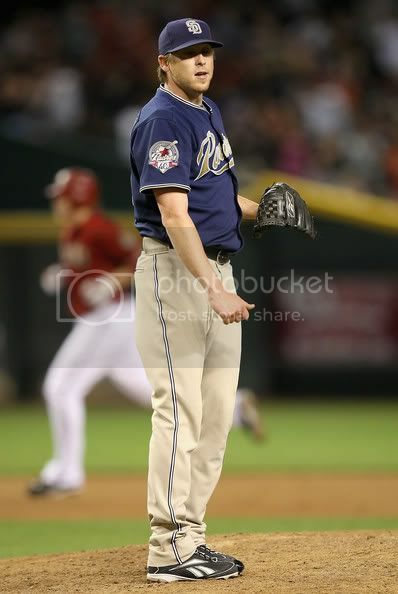 Another defensive miscue followed and then Luke Gregerson allowed a monstrous grand slam. Today Everth Cabrera booted an easy grounder that would've started a doubleplay. This is not how the Padres have played all year. The team's strategy throughout the year has been simple but impeccably executed: keep the games close with strong starting pitching and defense, scrap out a lead with timely hitting, and then hand things off to a virtually unhittable bullpen. During this streak their pitching has been atrocious, allowing almost 6 runs per game and the sputtering offense has only scored 2.3 per contest. So, is what we've seen these past nine games the real talent level of the Padres? Were the first 5 months of pure excellence a total fluke? I really don't think so. But the mounting losses are undoubtedly testing this team mentally and you can see guys starting to freak out and have tantrums like Jon Garland did in the Padre dugout during an ugly inning yesterday. Perhaps that's exactly what a discombobulated team needs to get back on track. Searching for an excuse for this streak of struggles, we can at least grant that they've played against good teams. The Diamondbacks started out terribly but they have played much better baseball as of late, finishing August with a 16-13 record (the same as the Padres during that span). The losing streak began with a 11-5 pounding in Arizona before the Friars came home for a weekend series with the Phillies who always play great this time of year. With reinforcements like Chase Utley and Jimmy Rollins having just returned to the lineup and Joe Blanton and Chase Utley throwing gems, the Phils swept their opponents at Petco. I was at the Saturday game (pic below) and the Padres looked lifeless, showing no indication of the determined, tough at-bats and late inning rallies that have been customary for this San Diego team for basically the last calendar year. After that embarassing sweep in their home park they went back over to Arizona again and got walloped in a three game set (outscored 19-6) and now the last two games they've battled a Colorado team that is on fire (as they always are at this time of the year) and against whom they've had trouble all season, winning just 4 of 10 games against the Rox. Back in May I stated that the Rockies would probably make a surge eventually and the Padres might not be good enough to withstand it when it comes. Well, here is that surge as they've climbed to within 5.5 games for the first time since July, their best player is back in the lineup after a month on the DL, CarGo is heating up and one mustn't forget the resilient Giants who have continued to nip at the Padres' heels, now sitting only 2 games back. It really is looking like it'll be an exciting September in the NL West. Last night I found myself up in Los Angeles and actually rooting for the Dodgers as they played the Giants. I'll hopefully make a post entirely devoted to that experience but the Dodgers managed to win and keep the Giants down, otherwise they'd only be 1 game back right now. So...will the Padres win another game this season or anytime soon? Of course they will. I think they'll either win today's tilt with Clayton Richard on the mound or, if they lose again and push it to double digits, Mat Latos will blow away the Dodgers on Monday and we'll all forget this ever happened. But now since they've allowed the Giants to get close again the question remains: can this Padres team win the division? The Padres have an extremely tough schedule to finish out the year. The worst team they'll face is the Cubs and they've got to face San Francisco seven more times, the Dodgers six, plus seven games against the Cardinals and Reds. Once they shake off this embarrassing stumble, this is still a quality Padres team. Keep in mind Miguel Tejada is actually hitting pretty well with a 106 OPS+ thus far as a Padre, Chase Headley and Adrian Gonzalez were great in August, and the surprise explosion that is Chris Denorfia's 2010 season hasn't slowed down one bit (145 OPS+ in August). If Ryan Ludwick can shake off his slow San Diego start (.658 OPS) and hit at a rate closer to his established norm, I think the offense will not only be fine but it should be an improvement on what they've been winning with for much of the year. The rotation looks a little more troubling as Wade LeBlanc seems to have lost his touch (although he had great K/BB numbers last month, he's been giving up far too many homers), Jon Garland's luck is fading and Kevin Correia continues to struggle (5.52 ERA on the year, 7.20 in August).There are reinforcements available in-house though, especially long relief man Tim Stauffer who's been itching to get back in the rotation and I think Bud Black and Darren Balsey will sort things out with the starters. The pen is not to be worried about with this team, it's too deep and too talented to fuss over. These next four weeks are going to be thriling and, no matter what happens, I'll be glad to be watching pennant race Padre baseball in September which is something I never thought possible. I just hope they don't emulate the recent fate of my ignominious Mets.